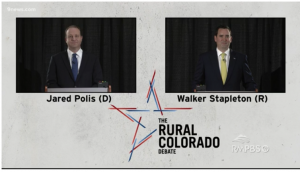 Jared Polis finally granted an audience to Western Slope residents to hear him debate important issues with Walker Stapleton in the governor’s race. PeakNation™ will recall the snubbing Polis gave to the Club 20 debate, his main reasoning then, folks would be charged $25 general admission. There was no general admission fee at the Saturday night debate in Grand Junction because there was no general admission — the debate was invitation only and shown on PBS, according to the Daily Sentinel. Sounds like a crowd tailer-make for Polis. The liberal millionaire is cherished in PBS circles, and he’s accustomed to tony, invitation-only events. Unless you have a standing Saturday night date with PBS, we’re guessing you missed it, so here are the highlights. PBS debate panel on a swinging Saturday night. The only issue Polis thinks Western Slope locals care about is broadband and internet access. Either that or it’s the only issue he can discuss with any detail. Meanwhile, Stapleton supports Jordan Cove and the economic boost it brings to the region. Polis probably thinks that is a Bed & Breakfast destination on the Pacific Coast, and he won’t commit to clicking either the “like” or sad face button on their Facebook page. Also, Polis totally flip-flopped on Amendment 73. Polis told a Denver audience on Friday he would not support any tax increase on the ballot including the amendment. Then totally weenied out in Grand Junction and said he had not taken a position on Amendment 73. “I understand that it may not be politically convenient for Jared Polis to take a position on Amendment 73, but this is the biggest tax hike in Colorado history and playing both sides shows a serious lack of leadership on his part,” Singer said. Memo to Polis: The Western Slope isn’t as isolated as you think from Front Range news. They actually do get internet access there, and they can read. And now they know you were fibbing to them.